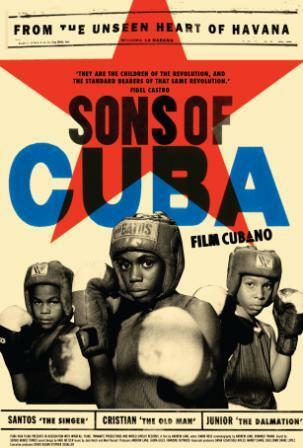 A documentary and first feature film by British director Andrew Lang takes us deep inside Cuba’s Havana Boxing Academy. It focuses on three boys in a group of 10-15 and their coach. They are training for the 12-years-and-under nationals. Each province in Cuba has a boxing academy. They’re state-supported and a training ground for the Olympics. This country with 11 million people has won the most Olympic metals for boxing. We see the boys get up at 4 a.m. in a grueling workout. We also see them in class. The academy is kept together with spit and tape (I don’t think it’s like an Olympic training center in the United States, nor are these athletes pampered.) Tires are used to practice punching. Their showers are cold. They all sleep in one room with bunk beds. Their diets are meager. The boys are encouraged to cooperate with each other. And, they all want to be heroes of the Cuban people. Cuba’s campaign for good health and athletics started with the revolution. The film distinguishes itself because the boys and the coach let us inside their heads in a way that’s very different from the film, “Hoop Dreams.” The young boxers speak with matter-of-fact honesty. Tears abound in the film. On the weekends, the boys go home. What’s surprising is the tenderness you see with their moms and family. Maybe it’s because of that tenderness that helps the boys work through their very rigorous physical and mental training. Their coach, Yosvani, is a tough disciplinarian and a very tender father figure. They’re weighed three times a day to make sure they stay within their weight class. This seems to indicate that their hearts and heads aren’t being trained to be the “baddest of the bad.” We’re watching little people become full human beings with a socialist, cooperative bend.